On December 16, 1944, in the dead of winter, the German army lashed out at the United States army in an all-out counteroffensive into the rough Ardennes section of Belgium. 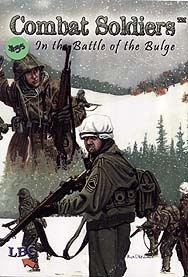 This is known to history as the Battle of the Bulge. This card game provides a recreation of elements of that chaotic battle as each player simultaneously commands both US and German military forces in attempts to hold and seize major objectives. Each objective has unique capabilities that allow the player holding them to "bend" the rules. Multiple scenarios keep the game "fresh" for repeated playings and allow players to explore various aspects of military operations. Mines, friendly fire, air drops and other incidents can affect play in unanticipated ways. YOU are in command. Can YOU win amidst the snow and evergreens of the Ardennes?